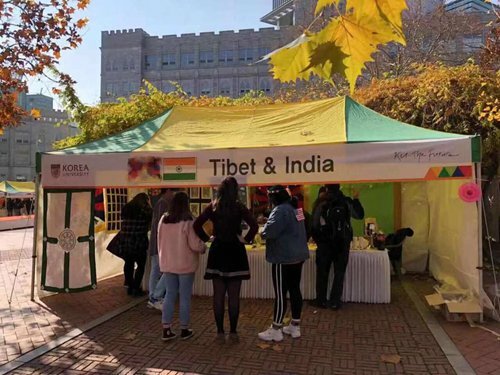 (TibetanReview.net, Nov16, 2018) – Calling it a mistake, claimed Chinese students at a South Korean university and the Chinese embassy in the country have protested against the placing of Tibet and India in a separate common booth at an international student festival on Nov 14. The university has said it could not do anything about it, but the Chinese are insisting on an apology. During the International Students’ Festival of Korea University, the school put China’s Tibet Autonomous Region and India in one booth, complained China’s official globaltimes.cn Nov 15, citing pictures posted online by outraged Chinese netizens, claiming to be students of the university, on Sina Weibo. The report noted, citing photos, that the booth also displayed “a flag which is a pro-independence symbol adopted by the ‘Tibetan government in exile’” together with India’s national flag. The report also complained that China’s Hong Kong Special Administrative Region and the island of Taiwan were assigned to separate booths, not in the same booth as the Chinese mainland’s. The report said the Chinese embassy in South Korea had also lodged a representation to Korea University and the South Korean government. The University’s International Students’ Festival is an annual event which promotes international students’ cultures and brings together locals. Students arrange the booths to display cultural aspects of their home countries, the university has explained. The report cited an employee from the communications team of Korea University as explaining that “Tibet and India were assigned to the same booth because the booths were assigned by region, not by nation or political status.” Besides, the university has spoken of having assigned booths according to the number of students from different countries and regions. Because there were not enough students from the Tibet Autonomous Region and India for each to have one booth, they grouped them together by region and by distance, the report cited the university official as explaining. He has also said that because there were many students from Hong Kong and Taiwan, they were assigned to separate booths. While he has said the university could not do anything about it, the Tibet booth was stated to have been removed later on. A female Chinese mainland student, named A Qing (pseudonym), has said the Chinese Students and Scholars Association of Korea University was negotiating with the university, hoping it could consider Chinese students’ feelings and apologize. Such associations, set up in many countries with Chinese students, are known to be funded by and to take orders directly from the local Chinese embassy or consulate.